Hello traders! I’ve just come from our beautiful Woodland Hills, California office, and one of our veteran students asked me a question about Japanese candlesticks, specifically referring to an article I wrote a couple of years ago. With his questions in mind, I’d like to expand on how I use weekly candles to give me a bias for the following week. Let’s go! Now that you have read that previous article, let’s talk about what to do if we aren’t already in a trade on the currency pair in question. 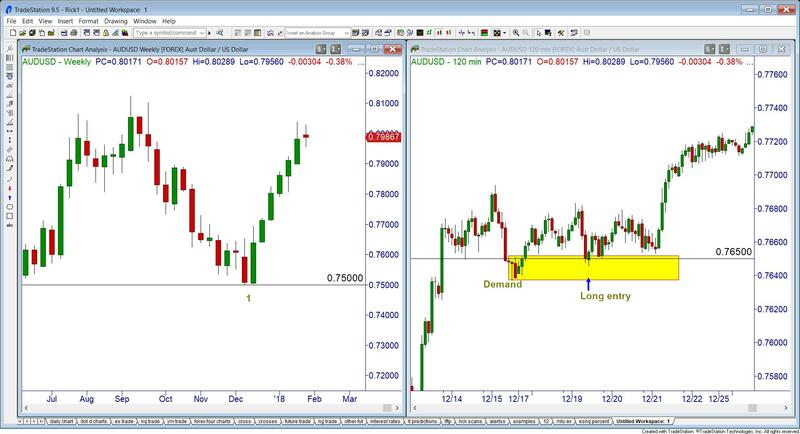 In the following AUDUSD pair of charts, let’s say you find yourself looking at the pair around the time frame marked 1. Obviously, the pair has already had a large move to the down side, so you aren’t still looking for shorts way down here are you? You especially shouldn’t be with the big round number of .7500 hanging out down here (a psychological level of support/resistance.) Instead, when the first green bodied candle in this new uptrend decisively breaks past the previous week’s high price, you decide to look for long trades. That previous week’s high was formed on 12/05, and didn’t break until 12/14. After the major players have given you the hint that they are no longer shorting, but going long, we can now look for long trades on our smaller timeframes. In the corresponding one-hour chart, you had an opportunity to buy on 12/19 near the 0.7650 mark. While it took a couple of days for you to make a lot of pips, the signal was clear. OK, let’s say you missed that one, end of year holidays and all. How about one after the start of the year? In this next picture, you noticed a weekly high of about 0.7874 that happened on Jan 5. (This weekly candle is marked 2). Once you had permission to look for long trades, as the previous weekly candles high had been broken, you could have gotten long around the 0.7847 mark. By using this technique, you won’t be early or first to these trades by any means; however, your probability of being correct in this direction will go up substantially. Now, seeing where this chart is currently trading (at the time of this writing), I wouldn’t still be going long using these time frames. If you are long, please continue to manage your winning trades appropriately! Now, how about an example for the short side? 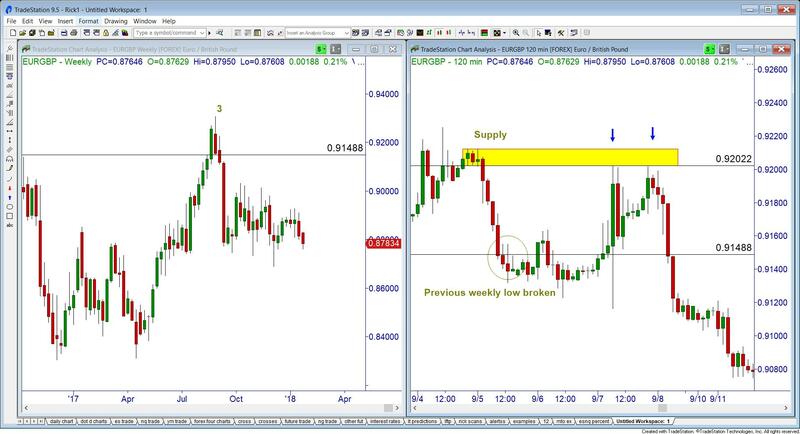 The weekly low on the EURGBP was on Sept 1, and was broken the following week on Sept 5. (Weekly candle marked as 3). Once you had your short bias, or your permission to look for short trades, we must wait for a rally into supply to take any short opportunities. 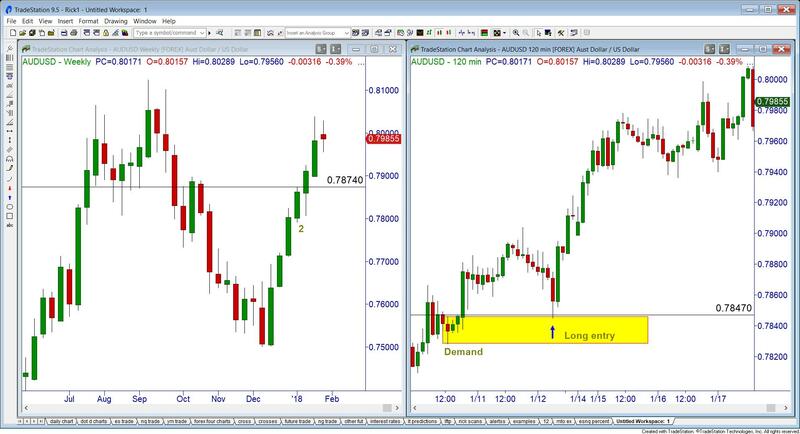 On both Sept 7 and 8 we had chances to get into this short trade. Now, I must make a couple of things super duper clear. This technique to get a long trade or short trade bias works very well during up or down trending markets. When you find a chart that is going sideways, our third trend direction, this bias technique will not help much at all! In fact, it may hurt more than it helps! The second point I want to make is, you must also take into consideration what the trend HAS BEEN. If your trend has been going UP for several weeks, taking you into a long term supply level, I would definitely NOT be looking to continue trying to find trades on the long side. On the other side, if your trend has been going DOWN for several weeks, taking you into long term demand, I wouldn’t be looking for any more short trades. Is Your Market Analysis Benefiting You or Someone Else? Are you having trouble picking currency direction? Who are the real beneficiaries of MIFID 2?